In an article in the Central Somerset Gazette, Councillor Jon Cousins of Glastonbury, England is quoted as saying that the town’s current coat of arms is “a device of cruelty and intolerance” and may breach equality legislation. He says it has strong anti-Catholic sentiment and pinpoints a puritanical time in the town’s history. 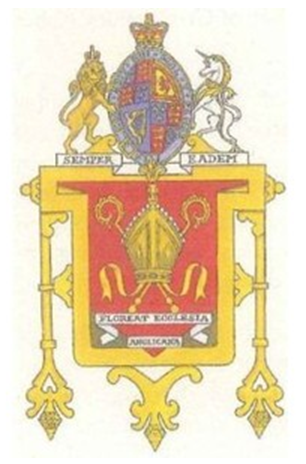 Admittedly, the motto (which is placed on the shield, and not below it as would normally be expected) Floreat Ecclesia Anglicana (Let the Church of England flourish), might be considered to be anti-Catholic, but it’s not a particularly Puritan sentiment. (Trust me on this; I’ve got Puritans in my family tree. Dour bunch for the most part.) And, in fact, it could certainly be argued that the bishop’s mitre and cross croziers are not “puritanical,” either. Councillor Cousins says he believes (without saying why he does so) the crossed croziers and red background were a reminder of the treatment of the last abbot of Glastonbury, who was hung, drawn, and quartered on Glastonbury Tor following the dissolution of the Abbey. which shield the Councillor suggests should be placed beneath an image of the sun rising behind Glastonbury Tor and with the motto Unitate Per Diversitas (Unity through diversity). Glastonbury Mayor Ian Tucker has agreed for a group of representatives from various faiths and town historians to consider if the current shield should be changed. The full article can be found on-line at http://www.thisissomerset.co.uk/Glastonbury-shield-arms-device-cruelty/story-18482928-detail/story.html#axzz2QYxqa6zr At the end the article, the Central Somerset Gazette asks “What do you think? Is the current emblem cruel and intolerant, or should it be kept for the sake of tradition?” and includes an email address to send responses.